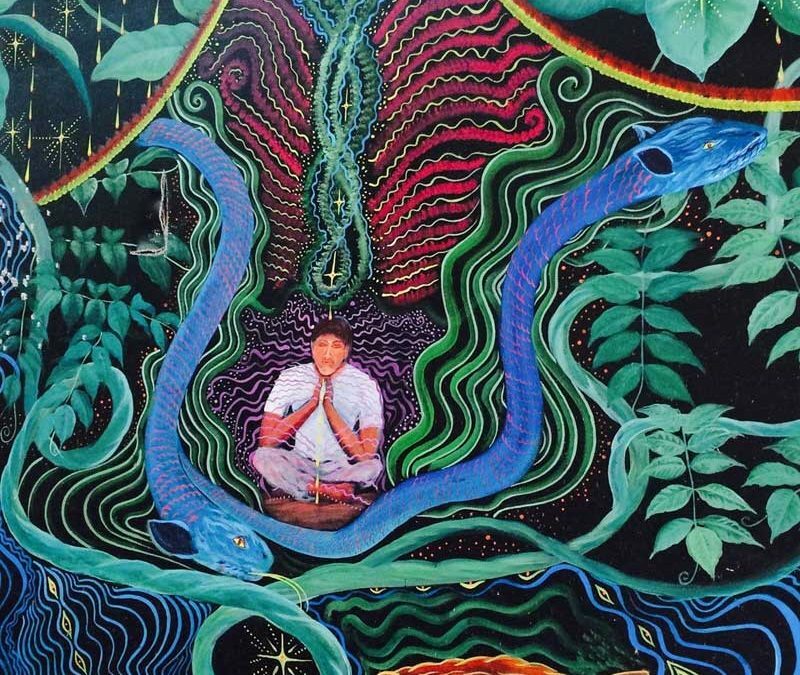 If you’ve been drawn to this blog, it’s likely you’ve either experienced or heard of Ayahuasca. Pronounced (eye-a-wus-ca), this ancient hallucinogenic brew or tea has been used by shamans and healers in the Amazon Rainforest for centuries. Traditionally, it is used as a medicine to help people purge negative energies, experiences and beliefs from their bodies. It can assist people in finding clarity, healing and purpose in their lives. But drinking ayahuasca should never be entered into lightly. The brew is actually a combination of two plants found in the Amazon. One is the Ayahuasca vine (which means ‘vine of the soul’) and the plant Chacruna which contains a relatively high amount of the psychedelic substance DMT. The brew is capable of inducing altered states of consciousness, usually lasting between 4-8 hours after ingestion. Ranging from mildly stimulating to extremely visionary, ayahuasca is used primarily as a medicine and as a shamanic means of healing. Indeed, the internet is littered with personal accounts and stories of experiences. Some are life changing, some are horrific. It seems to be the latest craze in spiritual fads with Westerners travelling to the Amazon from all over the globe. But, is it really a fad when it has been used traditionally by shamans for thousands of years? Some shamans, at great personal risk, travel to Western countries where the brew is illegal and conduct ceremonies. They understand the great importance this ancient brew possesses in bringing spiritual awareness and understanding to Westerners. After all, it is predominantly Western culture that is ultimately destroying our planet and its natural resources. Furthermore, it is common for Westerners to be very cut off from their spiritual side through societal conditioning. Increasing rates of depression, anxiety and other illnesses in Western culture suggest that something isn’t quite right. Many shamans understand that Ayahuasca may be a remedy for this. After all, its ability to create profound change at an individual level can have a flow on affect to many. I have had a few personal experiences drinking Ayahuasca in a few places around the world. All times, I entered the ceremonies under the guidance of an experienced shaman. This is a MUST if you are feeling called to try the brew. As mentioned, the experience should NEVER be entered into lightly and the drinker’s intention should never be for recreation. Vomiting (or purging), diarrhoea, nausea, visions, sweats, chills etc. are common and you need to have support around you in case things get a little hairy! I have experienced all these symptoms and more. When I first started drinking my body was riddled with adrenal fatigue and hormonal imbalance. I found that the ayahuasca worked deeply on my struggling nervous system. It was highly anti-inflammatory and I spent a lot of time purging physical and emotional toxins from my body. The Ayahuasca ‘spirit’ is a highly intelligent being. She (the ayahuasca vine is considered a female plant) will always give the drinker what they ‘need’ rather than what they ‘want’. This is why the journey is different for each individual and every ceremony can be a completely different experience. Some ceremonies for me have been more visual, some more physical, some painful, some sad, some blissful and some that don’t seem to make any sense at all! However, post ceremony, one aspect remains constant, a feeling that something has shifted within. You feel lighter. Like you have been cleansed. Sometimes you are given answers or advice. And sometimes you can feel her moving around every cell of your body activating your life force. She can remove the veil and show you your truth. You can travel through different dimensions and experience entities, spirits and other life forms on your way. Whatever your experience, it’s always what you NEED. As human beings, we can try to over-intellectualise the journey or we can just trust that whatever occurred was what we needed. One ceremony I spent the whole time laughing. I was completely outside of my body and laughing at the human experience from a soul level. Another I cried for 6 hours whilst the medicine showed me my deepest and darkest fears, everything id been running from for years. But how does this help us? Well, from my understanding, Ayahuasca actually has the power to rewire your neural pathways. By bringing suppressed fears or inner desires from the unconscious mind to the conscious mind we are able to release and heal what has been hidden. So much of the time we are highly unconscious of our limiting beliefs and behaviours that actually have a huge impact on how we live our lives. Ayahuasca assists us in the process of ‘purging’ what doesn’t serve our highest good. She wont do the work for you but she will help you see what you need to in order for change to occur. I have spoken to many people whose lives have been changed for the better after trying Ayahuasca. I am one of them. I believe it helped me to understand, heal and manage a complex illness that I was struggling to find relief from. For that I am truly grateful. What’s more, it has helped me in my spiritual understandings and has given me the tools to live life more simply and authentically. Is Ayahuasca for everyone? no. Some people are ready for the experience, some are not. Some may only try it once, some may consume it many times over their lifetime. I do believe that she ‘calls’ the drinker when they are ready to drink again or drink for the first time. Perhaps you are reading this, have never drunk before but you keep hearing or reading about Ayahuasca. This may be the universe gently nudging you towards the medicine. If so, ensure you do all the appropriate preparation and research before you embark on the journey. Mostly, be aware that your life may change significantly afterwards. After all, you can never un see what you have seen!